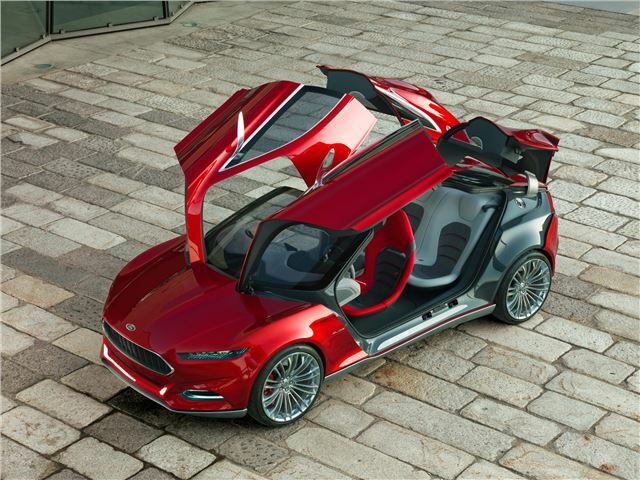 Ford’s Evos concept will premiere at Frankfurt, and it shows the new direction of Ford design. The four-seater fastback is broad and low, with styling designed to echo classic GT cars, but modernised with bold, muscular lines. Gullwing doors, both front and rear, provide easy access to all of the seats in the high tech cabin, which includes dedicated touch-screen controls for rear-seat passengers and a driver oriented design. The interior is made from hypo-allergenic materials and features a heart-rate monitor to monitor the wellbeing of the driver and passengers. Systems in the car are ‘cloud-optimised,’ meaning they can connect to a wealth of information and adapt accordingly. For example, the car could learn the most common routes taken by the driver and optimise the route depending on traffic conditions or to provide the most efficient route. Connecting to the home is another example – the Evos could open the garage door and turn on the lights at home automatically as it approached home. The Evos Concept is powered by a plug-in hybrid system, which can operate with a petrol engine and an electric motor which can operate together or separately depending on the situation. With cloud-optimisation the system would allow the car to select the best system for the environment – it could, for example, choose pure electric mode in towns. For more information on the Evos Concept follow our coverage of the Frankfurt Motor Show here.